In 1950, the shape that was to become, for all practical purposes, the definitive Maxi-Car hub, emerged. Machined by hand from stock, there is some inherent variability to the shape of the hub body, especially the transition from the bearing housing into the inside of the hub flange. 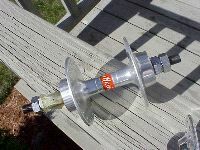 Sometime during the 1960s, prior to the introduction of holes in the hub flanges, the stamping on the hub barrel was replaced by the red and white Maxi-Car sticker. 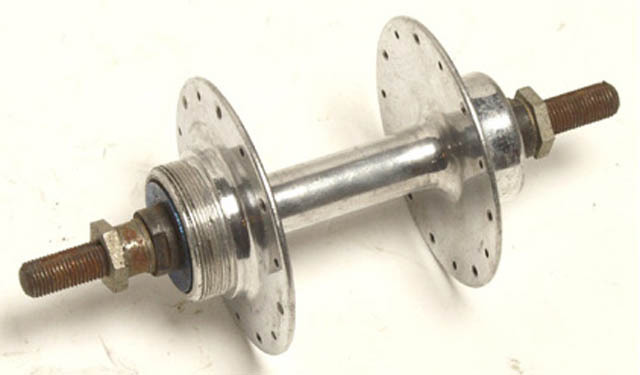 Low flange hubs were also made, but are much less commonly seen. Some hubs exist with special blue dustcaps - I'm not sure of the specifics of why these were produced, perhaps for Daudon?